SDIM0758.jpg, originally uploaded by andi808. 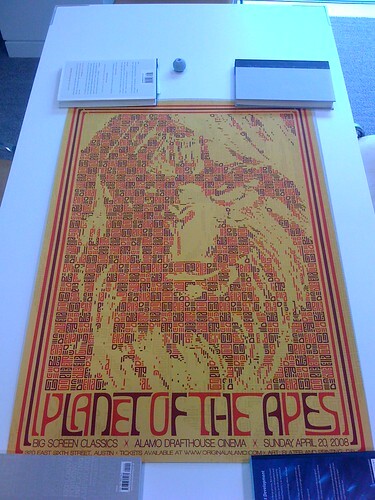 The Apes, originally uploaded by ED209uk. I’m finally getting around to put some of the talks I gave last month in San Francisco online – the first of which being a talk I gave at Adaptive Path’s MX conference entitled: Battle For The Planet Of The Apes. 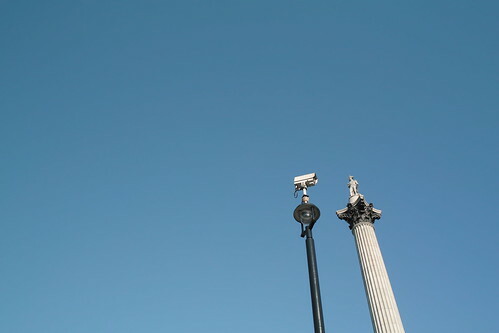 Unfortuntely, slideshare seems to have eaten a few images, but I’ll try and correct that in coming days. Thanks to AP for the invite, and for the attendees of MX for their attention! I’ve long been Col. Blimp in arguments with m’colleague Cheathco on the future of global transport. George’ll be hot for space elevators next, then I’ll really have to find a new schtick, or make him my best mate. And that’s the worrying thing – this really seems like a game of what resource will run out – the cheap energy to do the R&D into The Gordelpus, the rare materials to make The Gordelpus, or the sociopolitical will to make The Gordelpus. It’s like the early stages of a resource-trading game like Settlers of Catan. If we can just get enough of the vital stuff, we’ll have a runaway advantage later in the play. Which bets shall we make with which resources in order to get that runaway multiplier before it’s too late in the game? I guess I am with George after all – making some audacious bets mid-game looks pretty good right now. P.s. : “The Gordelpus” is Olaf Stapledon‘s quasi-nuclear magical/religious/scientific endless-power mcguffin of the First Men in his awe-inspiring Last and First Men. A century after the founding of the first World State a rumour began to be heard in China about the supreme secret of scientific religion, the awful mystery of Gordelpus, by means of which it should he possible to utilize the energy locked up in the opposition of proton and electron. Long ago discovered by a Chinese physicist and saint, this invaluable knowledge was now reputed to have been preserved ever since among the elite of science, and to be ready for publication as soon as the world seemed fit to possess it. The new sect of Energists claimed that the young Discoverer was himself an incarnation of Buddha, and that, since the world was still unfit for the supreme revelation, he had entrusted his secret to the Scientists. Bonus (self)link: Olaf Stapledon’s amazing timelines he drew up while conceiving the book. 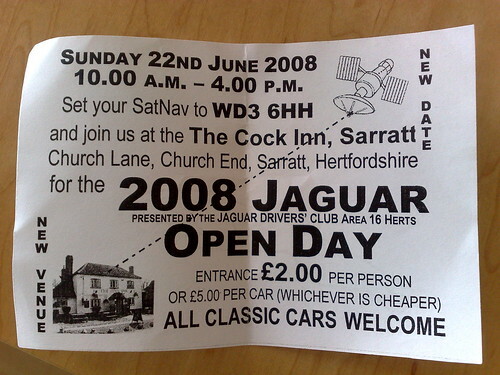 Set your satnav, originally uploaded by nedrichards. Middle England meets The Jetsons. Kind of mind-blowing.